Charting innovative directions in the environmental humanities, this book examines the cultural history of climate change under three broad headings: history, writing and politics. Climate change compels us to rethink many of our traditional means of historical understanding, and demands new ways of relating human knowledge, action and representations to the dimensions of geological and evolutionary time. To address these challenges, this book positions our present moment of climatic knowledge within much longer histories of climatic experience. Only in light of these histories, it argues, can we properly understand what climate means today across an array of discursive domains, from politics, literature and law to neighbourly conversation. Its chapters identify turning-points and experiments in the construction of climates and of atmospheres of sensation. They examine how contemporary ecological thought has repoliticised the representation of nature and detail vital aspects of the history and prehistory of our climatic modernity. 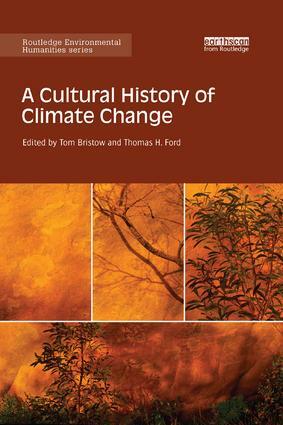 This ground-breaking text will be of great interest to researchers and postgraduate students in environmental history, environmental governance, history of ideas and science, literature and eco-criticism, political theory, cultural theory, as well as all general readers interested in climate change.